Tax, Constitution and the Supreme Court discusses the fundamental principles of taxation as expounded by the Supreme Court through its judicial pronouncements from 1950 till date in a simple and lucid manner. 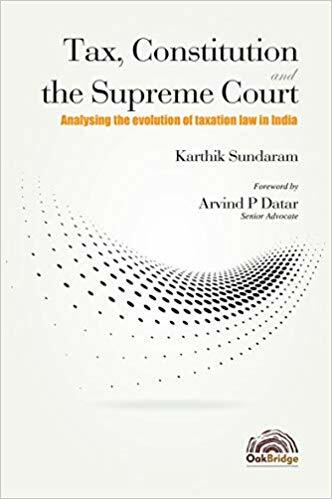 The author seeks to trace the evolution of taxation laws in India, which entails an in-depth and comprehensive understanding of the constitutional provisions as well as the decisions of the Supreme Court. The book addresses some of the fundamental questions on taxation, a concept which forms a part of everyone’s lives. Presented in thematically arranged chapters, the book delves into the first principles and covers themes including Concept and components of a tax, Legislative power and legislative fields, Territorial jurisdiction, Retrospective taxation, Tax planning versus evasion, and, Interpretation of Statutes. The book will be a valuable addition to the libraries of practitioners, law firms, chartered accountants, tax consultants, academicians, students and law school.